When I checked into my hotel in Algeciras shortly after 4pm, I was anticipating a rest day; down time to go through photos and catch up on my freelance editing duties. But since the day was young (the sun sets shortly before 10pm), the receptionist encouraged me to take the bus to nearby Gibraltar, the British Overseas Territory. So after dropping my things off in the room, I set out again, heading towards a place that I really only knew by its flag from playing Geo Challenge obsessively back in the day. Shortly after the border crossing. Gibraltar is a bit of a mind trip - it's like being in the UK what with the same iconic red phone booths, bins for "litter" rather than trash, and crosswalks that remind you which way to look for oncoming traffic. But, then, you open your ears and hear the locals effortlessly slip betwee British English, when addressing tourists, and the local dialect when addressing each other. (It sounds like Spanish but with the sing-song lilt of Italian). It's famous for the iconic rocky cliff that towers over the town and port. I made my way through the city center, hoping to catch the cable car up to the top but, alas, I had missed the last one. In the parking lot I bumped into a tour guide who, for the same price as the cable car, drove visiors up to the top in a minivan. I was game, but unfortunately I was the only tourist around. 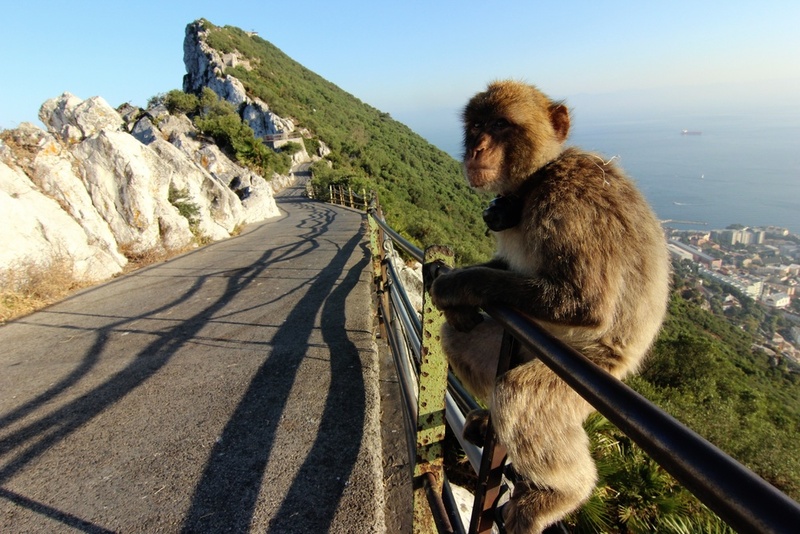 Explaining that I only had a short time to spend in Gibraltar, the sympathetic guide told me to hop in while she tried to wrangle a bigger group. We zoomed back through the city center, with her pausing occasionally to solicit passersby, until finally admitting defeat. But the prospect of failure made me even more determined to go. I offered to pay her double the normal rate to take me up the rock alone, although I don't think money was the issue so much as that the company prefers the vans to be full. "It's fine," she said finally. "I'll just tell them that I took a break to get my daughter from the beach." My first sight of Africa. Moody monkey. The guide said his collar is for National Geographic reesearch. And off we went, mounting the perilously narrow and steep switchbacking roads. It was really something to look down on the marina from above, and to see Africa emerging from the mist on the opposite side of the strait. But for me the best part was at the peak, where the famed macaques live. With the sun close to setting, we made our way back down, making other stops to admire the different views. Occasionally she paused to exchange greetings with drivers coming the other way. "Gibraltar is very safe, but it's so small that you know everyone's business!" She continued to point out the territory's other unique features, such as the tax-free shopping - which explained the many tourists I'd seen toting around cartons of cigarettes and bottles of liquor. Not to mention the cars that crossed the border just to fuel up. It was getting dusky by the time she dropped me off near the marina so that I could finish looking around. "Time to get back to work," she said with a wink as I shut the door. There's something oddly romantic about an airstrip at sunset.